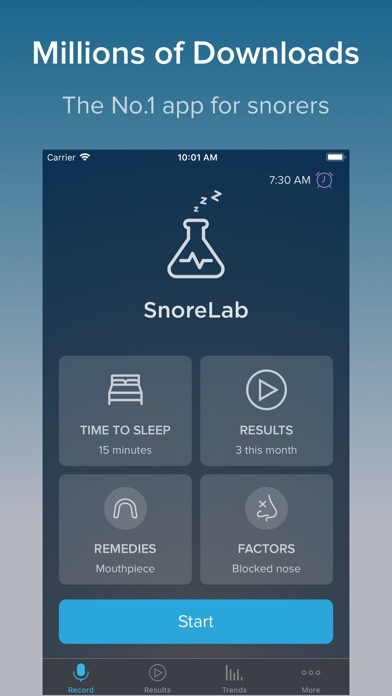 The most popular and innovative app of its kind, SnoreLab records, measures and tracks your snoring and helps you to discover effective ways to reduce it. SnoreLab has monitored more than 50 million nights of sleep and has helped millions of people to better understand or even eliminate their snoring problem. The app is very easy to use: simply set SnoreLab running next to your bed whilst you sleep. 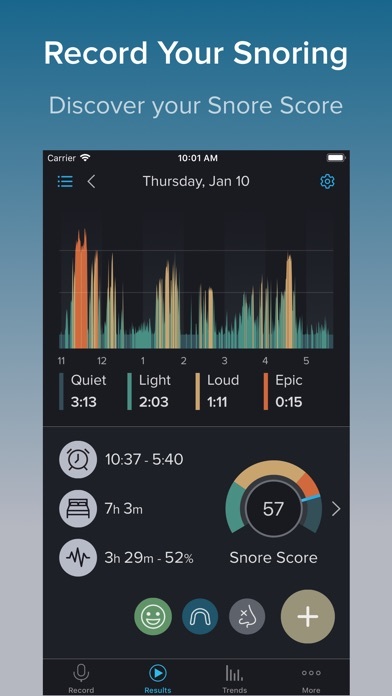 In the morning you will discover your Snore Score, exactly when and how loudly you snored, and listen to some highlights! 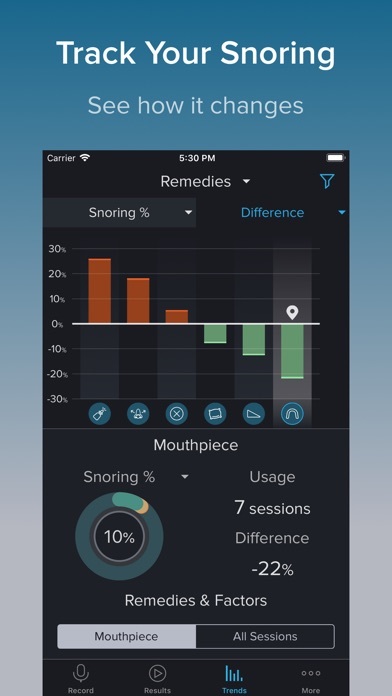 SnoreLab lets you log and track lifestyle factors and any snoring remedies so you can see how they impact your snoring. SnoreLab is attracting endorsements from doctors, dentists and users alike. 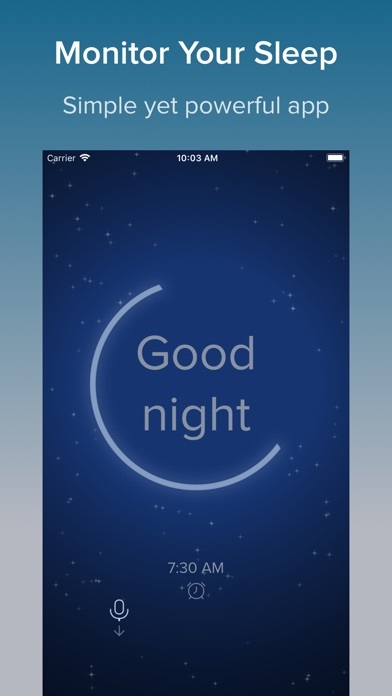 The app can be useful in medical consultations when investigating sleep disorders such as sleep apnea. Are you a room shaker or a snorter? A buzz saw or a whistler? Or do you just purr like a kitten? Discover the truth with SnoreLab! What's your Snore Score? 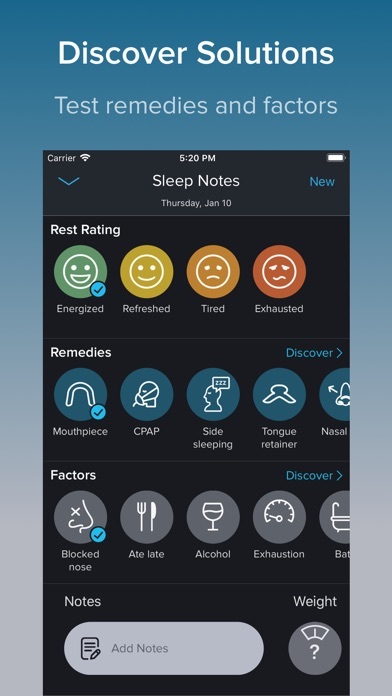 'An ingenious app' - Mail Online 'Best Health App - Runner-up' - Best App Ever Awards 2014 FEATURES: ▷ Advanced snore detection algorithms ▷ Records sound samples of your snoring ▷ Measures snoring intensity (Snore Score) ▷ Compares snoring across nights ▷ Tests the effectiveness of any snoring remedies that you use ▷ Measures the impact of factors such as drinking alcohol on your snoring ▷ Records sleep statistics ▷ Optional full-night recording mode ▷ Email sound files ▷ Provides information about snoring remedies ▷ Easy to use, no calibration needed ▷ SnoreLab can integrate with Apple Health to record your sleep statistics and body stats. ▷ Top 10 Medical app in 30 countries ▷ "What's Hot" medical app in 33 countries ▷ Featured in Lifehacker, The Sunday Times, The Guardian, Quantified Self and others ▷ Recommended by top US doctors on HealthTap SnoreLab has an average rating of 4.7 stars from over 10,000 user reviews. Here is a selection of some of our favourite reviews: "App is truly amazing, I think it is a must have for every fellow man :)" "Fascinating and helpful - I learned what's going on when I'm sleeping." "This app is wonderful in that not only does it work, but its ease of use. This is a simple, effective tool to better health." "Excellent app. This helped me to reduce my snoring by applying some of the remedies listed. My wife and I thank you, especially my Wife!" "Take it from an MD... This program works and is a very useful tool to share with your doctor." "This app is a revelation. For the first time I feel in control of my snoring problem. Thank you SnoreLab!" 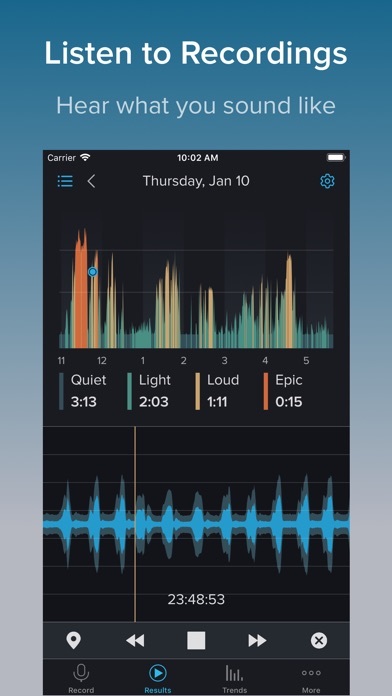 "SnoreLab is the best sleep recorder I have tried. My snoring is down 40 plus percent in just two weeks." The SnoreLab app is not a medical device and does not claim to diagnose, treat, or cure any disease. I love this app. I would REALLY love this app if it could adjust the baseline noise in my bedroom to account for my husband’s white noise machine. Thank you! This app is really amazing and these are not just empty words! It is easy to use and the results are clear and simple, giving an excellent indication of your snore score for the night but also graphs on your pattern over the days and weeks. It has given me the opportunity to test out some nose sprays, throats sprays, steaming etc., to see if any of these helped and I now have a better idea of what method is most effective. I tried another to compare but it just didn’t match up. After using the free option for 2 months now and between my husband and I having benefited greatly at no cost to ourselves, I have decided to buy the upgrade as this app truly deserves the accolades and support! Thank you to the developers for an excellent app! I’ve just tried this app for about a week, I have three complaints on it. 1, no where can I find what the score means. All it says is the average score for new users. What does that tell you? Is that just an arbitrary? 2, I have the app both on my iPhone and my iPad. I lay them right next to each other, next to my bed, and their scores will differ by 30 points. Why? And again, what do the scores even mean. 3, Two of the times I used this app, I went to slide it to the right to stop and it said it needs to run for more than 30 minutes. It ran all night and no data was recorded. I think a person would just as well served to use a voice memo app and just record yourself sleeping all night. This has helped me get a handle on how much snoring and other disturbances wake me unbeknownst to me during the night (think cat meowing/playing, train horns, barking dogs outside). I paid the 9.99 and totally worth the upgrade. I am a slender, athletic 56 year old woman who has struggled with sleep for many years. Snoring has been added to insomnia. 🙁 I was actually surprised to find out that my snoring score was so low because I struggle with sleep so much and assumed it would be high. But it helped me realize I am very much a mouth breather while sleeping (can hear that even if not snoring - quality recording is amazing) and how the few episodes of snoring I do have are waking me regularly. Since I’m such a light sleeper, I don’t usually snore long or super loud before waking up and moving, so snoring is short lived (thus low score) but constantly waking me up. Not sure exactly how to best address since my medical sleep study revealed mild apnea and insomnia and I don’t qualify for CPAP, but trying a few different things (side sleeping helps, have even tried putting packing tape on my mouth to keep it shut!!!). I may try the tongue device. You can also add things to sessions that may contribute to snoring (alcohol, late meals, etc.) to see if there’s a trend. I also compare it to my Fitbit to see when snoring is happening compared to deep/REM sleep (which I never get enough of). I may also address hormones (last resort - not a fan of HRT and have avoided for a decade even while going through premature menopause 10 years ago) since estrogen depletion can and does lead to worsening sleep and snoring. We shall see. May chicken out on the estrogen. Too many friends endured breast cancer. ☹️. But now I at least know what’s going on. I have to admit, I now feel sorry for my wife when I don’t wear my “appliance/mouthpiece”. I feel relieved when “epic” shows 0:00. Will show results to my physician in case more a more aggressive apnea related measure is warranted. Useful app developer(s). This program is helping me better understand what I need to do to improve my quality of sleep. I knew that I snored when my allergies were acting up, or if I was overly tired. I was shocked to see just how many minutes (or hours) I snored each night... and at what intensity. I can even play back snippets of recordings. Now as I actively take steps to remedy the problem... I can see the effectiveness each night! I have tried numerous solutions... and it is crystal clear which ones are working and which ones are not! Fabulous! Thank you SO much! I was using Sleep Cycle app before this but that up does not give me enough snoring to listen to as it only saves some clips. With this app I can save the full night and I could jump easily to where I was snoring. It gives a lot of other info that is great. I knew that I wanted to use the premium features like Setting the recording mode to full so I immediately paid the 10 dollar in app purchase. You can use this app for free but I feel the premium features are with it. I have been using this app for a few months now and find it very helpful to Monitor my sleep and snoring. It’s good feedback especially if I change some of my behaviors like sleeping on a different side of the bed or losing weight etc. I actually found that losing weight is actually helping my snoring decrease significantly. Also, I think changing my diet also is helping. Note to the app developer: I really would like to be able to choose my own music to wake up to for the alarm. Can you please respond to this review? Tried 3 nights in a row to make it work and woke up with the app crashed with no explanation and no data.